Quilts have been a part of Utah’s heritage since the very first days of the pioneers. As they travelled west, they brought the age-old technique of quilting to provide both needed warm covers, and in time, as works of art. Quilts have long been a solution to what to do with the fabric from worn out clothing. By cutting and sewing the pieces together, quilts used pieces of cloth that might otherwise have been discarded. Often reflecting cultural influences, quilts were frequently made to commemorate major life events, such as marriages and births. Today, making quilts continues primarily as an art form, with festivals, competitions, and shows dedicated to quilts and quilting. Utah has some of the best quilt shows around, many reflecting the pioneer heritage as part of heritage festivals. Of particular note is the Panguitch Quilt Walk Festival in June. It remembers the hardships of a group of early settlers who travelled across the mountain to another community in search of supplies. The deep snow hindered progress until they realized that they could spread quilts on the top of the snow and could “walk” on top of them. This feat is celebrated each year in an annual festival. the Snow Goose Quilt Show in February takes place along with Snow Goose Festival. Brigham City’s June Heritage Days includes a quilt fest. July and August seems to be the time for the most activity. Sites include the Springville Museum of Art, Alpine Quilt Show, the Castle Country Quilter’s Show and the Western Legends Quilt Show in Kanab. In addition to festivals, exhibitions, and competitions, many Pioneer Museums feature quilts. Often on display are the utilitarian ones used for normal day to day living as well as “art” quilts made for special occasions or as decoration. When planning a visit to a quilt show, check Bed and Breakfast Inns of Utah for a nearby Member Inn. Thanksgiving Point Institute welcomes Spring with the Annual Tulip Festival. Thousands of tulips will be on display during the Festival April 18 through May 3, 2014. Nearly 100 different varieties of tulips are displayed throughout the Thanksgiving Point Gardens. In addition, there is music, vendors, food, and garden tours available. Regular Garden admission applies, with child, senior and military discounts. Admission is free to institute members. Hours are 8 AM to 8 PM. Stay in a nearby Salt Lake City/Wasatch Front or Park City/Wasatch Back Bed and Breakfast Inns of Utah member Inn. Be sure to ask the innkeeper for other activities in the area. They are a wealth of knowledge and may even share their own favorites. From the tropical rainforest of ancient Maya, 16th century Europe, the Industrial Revolution, to the present day-the world has had a long love affair with chocolate. Throughout history, chocolate has been used in royal and religious ceremonies, as currency, a drink for the wealthy, a sweet treat for the masses, and a global commodity… “you’ll explore the plant, the products, and the culture of chocolate through the lenses of science, history, and popular culture”. Throughout this exhibit, the Museum will be hosting a variety of events for adults and families! Did you know?? Utah is the home of America’s oldest known chocolate. New research suggests Ancestral Puebloan people living in a village near Blanding, Utah were consuming chocolate as early as 750 AD. Don’t miss the chance to see pottery with the earliest evidence of chocolate discovered in the United States. • Hands-on activities for all ages—cocoa grinding, residue tests, and more! • Chocolate experts on hand sharing their knowledge of the plant, the products, and the culture of chocolate. Taste different kinds of chocolate, learn about the process of making chocolate, and discover Utah’s amazing chocolate scene. Included will be six courses of chocolate, both savory and sweet, each paired with specially selected wines. The event will be preceded by a cocktail party featuring chocolate cocktails and local beers provide by Shades of Pale. Tickets are $100 per person and can be purchased through Harmons. *All proceeds will be donated to the Natural History Museum of Utah. Utah’s Chocolate Story Past & Present…Anthropology Collections Manager describes the prehistory of Chocolate, its use in the Mayan area The chocolate story is centuries old. Anthropology Collections Manager Glenna Nielsen-Grimm describes the prehistory of chocolate, its use in the Maya area, and the latest research which suggests Ancestral Puebloan people living in a village near Blanding, Utah were consuming chocolate as early as 750 AD. Internationally recognized chocolate expert, Matt Caputo, tells the story of Utah’s recent surge to the forefront of the worldwide chocolate community. Utah is quickly becoming the epicenter of a culture connoisseurship involving chocolate that can fetch up to $180 a pound. Check back with the Museum often to find upcoming special events. Chocolate and its national tour were developed by The Field Museum, Chicago. Bed and Breakfast Inns of Utah Member inns are located throughout the Salt Lake Metro area. in addition, the Park City/Wasatch Back and Logan/Providence areas are not too far to make a convenient day trip. EXPLORE – DISCOVER – REMEMBER – the 40th anniversary exhibit of the Frontier Homestead State Park in Cedar City, UT, – details the history of the state park from its original concept through its current status as Frontier Homestead State Park. The State Park Museum tells the story of development in Iron County when in the 1850’s, Brigham Young sent Mormon missionaries here to mine and process iron. Visit now through December 31, 2013 to help celebrate the 40th Anniversary of the establishment of the Museum. Displays include horse-drawn vehicles used from 1850 to 1920 and a collection of pioneer artifacts. An iron industry exhibit features the only known remaining artifact from the original foundry – the town bell. Other items of interest include several historic cabins, a large collection of horse-drawn farm equipment, and Cedar City’s oldest remaining brick home, the Hunter House. When visiting the Park, enjoy a getaway at Amid Summer’s Inn Bed & Breakfast. Ask about other sites to visit – the innkeepers may even share their personal out-of- the-way favorites. Many visitors to Utah are familiar with Antelope Island – that big “rock” in the eastern side of the Great Salt Lake that the plane flies over before landing at Salt Lake International Airport. Many have also visited the island and hiked, biked, camped, watched birds, or visited the Historic Fielding Garr Ranch. Many also know that the island houses a great herd of Bison. BUT did you know that the island also plays host to one of the area’s most FUN Festivals? It’s the Antelope Island Stampede – not “stampede” as in rounding up the Bison – that’s later in the year, but the Balloon, kite, and entertainment festival. The event takes place on Labor Day weekend (August 30 – September 1, 2013 ) in the White Rock Bay Area of Antelope Island. There are hot-air balloons (launches if weather permits), professional kite flying, BMX bike stunt show and clinics, pie eating contests, kid’s activities, music and MORE. There is a $10 per vehicle state park fee to get on the island, and a $15 fee per vehicle to get into the event. If you buy in advance from Smith’sTix, tickets are only $20 plus Smith’s service charge. Though there are no Bed and Breakfast Inns of Utah members in the immediate area, Salt Lake Metro area inns are nearby. Even when staying in a Wasatch Back or Northern Inn, a day trip to the Stampede makes a fun getaway. The Mormon Miracle Pageant is an annual production retelling the story of Joseph Smith and his followers. Joseph Smith is considered by the members of the Church of Jesus Christ of Latter Day Saints (LDS or Mormons) to be a prophet of God. The story tells how Joseph translated the Book of Mormon, a record of ancient inhabitants of the Americas which was inscribed on gold plates, and follows the struggles of Joseph Smith and his followers through persecution and their travels west to settle in the Sanpete Valley of the Utah territory. The pageant was first produced in 1967 as a local effort, based on a 1950 book The Mormon Miracle. Today, a cast of over 500 reenacts events important to the story. The Pageant is held “under the stars”, and is free. 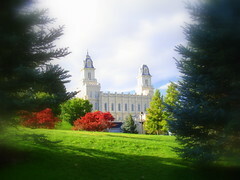 The presentation takes place at the foot of the Historic Manti Temple, with 14,000 chairs provided. Contact toll free 866-961-9040, 435-835-3000 or email Pageant committee. Manti is located on Historic Highway #89 in Central Utah, in the beautiful Sanpete Valley. When visiting the Pageant, include an activity or two to make it a complete getaway. There are more than 1000 miles of forest trails in the central Utah area designated for ATV and OHV use. The area is famous for the 350 mile long Arapeen ORV Trail. Or visit the Palisades State Park for golf or any for the numerous “fishin’ holes” available in nearby canyons. For lodging when attending the Pageant, or any of the other Sanpete County recreational activities or events, contact the Historic Manti House Inn, which is across Main Street from the Temple, or The Yardley Inn & Spa, just a few block from the Pageant site. Or just north of Manti is the Scott Farm B & B in Spring City. Manti area Bed and Breakfast Inns of Utah member Innkeepers are a wealth of knowledge of what to see and what to do. They may even share information on their own favorite hidden spots – the locals’ knowledge that makes any stay better. These two Heritage events are great for family fun, with a bit of history thrown in. The Scandinavian Heritage Festival in Ephraim, Utah, running Thursday through Saturday prior to Memorial Day, is possibly the largest Scandinavian heritage event in the Intermountain West. The big event for the Friends of Spring City is Heritage Day! On this day, and this day only, many residents open their historic homes, which have been carefully restored, to tours for the public. Spring City is the best preserved example of an early Mormon pioneer village. Spring City is on the National Register of Historic Pioneer Towns. Call a Bed and Breakfast Inns of Utah Member in Manti or Spring City for reservations and tips on how to enjoy the festivals “like a local”. Art and culture come together in a stunning new exhibit, “Weaving a Revolution,” at the Natural History Museum of Utah. The “Celebration of Contemporary Navajo Baskets” will feature more than 150 works of art created over the past 30 years by basket makers from the Monument Valley, Utah area. The 7,000 square-foot exhibit is open to the public with the regular price of admission and will be on display January 12 – April 28, 2013 in the Museum’s Special Exhibitions Gallery on the third floor of the Rio Tinto Center. When visiting either of theses exhibits, make it a “stay-cation” and book one of Salt Lake City’s BBIU Member inns. Cedar Breaks Ranger-Led Snowshoe Walk, a trek to the yurt (Winter Ranger Station), exploring and learning about the park’s winter ecology along the way. Meet at the Iron County Visitor Center (581 N Main St, Cedar City) 9:00am or in Brian Head at 9:45am (meeting location will vary in Brian Head). Registration is required; call 435-586-9451 to register and reserve snowshoes for the walk. For information call 435-586-9451 or visit www.nps.gov/cebr. NOTE: This event is dependent upon good weather. Visitor facilities open and scheduled interpretive activities begin, including Ranger-led hikes, geology programs, special events, and much more! all 435-586-9451, 435-586-0787 to verify opening dates and for more detailed information. When visiting Cedar Breaks, stay at a member inn of the Bed & Breakfast Inns of Utah. Close by are The Red Brick Inn of Panguitch, Amid Summers Inn in Cedar City, or just east of Bryce Canyon NP, The Buffalo Sage B & B in Tropic, UT. March is the time of year when Moab, UT begins to reawaken from winter’s cold and cloudy weather. The month is full of events to satisfy most any outdoorman’s desire. The Bed and Breakfast Inns of Utah has several inspected and approved Member Inns in the Moab area. They book quickly for these events, so make your lodging plans early. Try the Sunflower Hill and Cali Cochitta inns in Moab, and The Castle Valley Inn in nearby Castle Valley. Poison Spider Bicycles Spring Thaw – A fun, long weekend with demo bikes, women’s ride, shuttles, frame giveaway and guided group rides on the Bar-M and the Mag 7 Trails. Food and parties included for $40. Preregister for free t-shirt! For more info visit poisonspiderbicycles.com or call 435-259-7882. 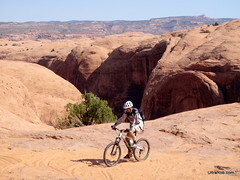 Moab Skinny Tire Festival – Four days of spectacular road cycling to Dead Horse Point State Park, Arches National Park and along the Colorado River Corridor. This thirteenth annual event inspires those living with cancer and benefits various research and survivorship programs. For more info visit skinnytireevents.com or call 435-260-8889. Join us for the 38th annual Canyonlands Half Marathon and Five Mile Run! The scenic USATF sanctioned and certified course follows the Colorado River through a dramatic redrock canyon. Food, awards, raffle and live music await you at the finish in downtown Moab. For more info visit moabhalfmarathon.org or call 435-259-4525. Moab 100 & 50K – The races are held on the beautiful and rugged Monitor and Merrimac trail, 16 miles North of Moab. Racers will run 5.37 mile laps with approx. 11,000′ of climbing for the entire 100 miles, and 3,500′ for the 50K. Hot food is available during the cool night, as well as other necessities at Base Camp. Placers and finisher’s awards will be given! For more info visit geminiadventures.com/new/?page_id=109 or call 303-249-1112. 24 Hours of Utah Endurance Races – This year’s races (6 Hour Nighttime Fun Run, 12-Hour, Team Relays, and Solo Challenge) will be run on the beautiful Monitor and Merrimac trail 16 miles North of Moab. Racers will run 5.37-mile laps with approximately 606′ of climbing per loop. Hot food will be available during the cool night and there will be an unmanned water station approximately halfway through the loop to help runners enjoy the rugged trails and view the beautiful canyons below. Camping is available at the Base Camp area and there will be placer medals given! For more info visit geminiadventures.com/new/?page_id=95 or call 303-249-1112. 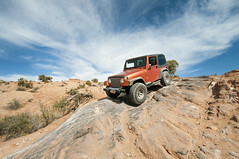 Easter Jeep Safari consists of trail rides, mostly day long trips, departing from Moab throughout this week long event. The Red Rock 4-Wheelers of Moab officially runs approximately 9 different trails every day, with “Big Saturday” culminating in the largest ever single trail ride departure happening – around 30 groups line up in down town Moab to head off in every direction for 30 different trails! For more info visit rr4w.com Note: This massive week-long event is one of the largest events of the year for Moab. Please make your lodging reservations as early as possible! Quilting in the Red Rocks Quilt Show March 9 & 10- Hundreds of quilts and quilted items will be on display. Classes, quilt appraisals, merchants mall, door prizes and tickets for winning our opportunity quilt. The Grand Center (182 N 500 W) – Sat, 9-5; Sun, 10-4 – Free admission! For more info visit moabquilts.blogspot.com or call 435-259-6447. And March 11,Banff Mountain Film Festival World Tour – The year’s best films on Mountain Sports, Culture, and Adventure. For more info visit banffcentre.ca/mountainfestival/worldtour/ or call 435-259-4859. Special Olympics Utah is sponsoring 5 Polar Plunge events in February to help raise funds to support their mission. When visiting any of these events, consider treating yourselves to an overnight at a Bed and Breakfast Inns of Utah member inn. February 2, the plunge is at Pineview Reservoir, east of Ogden. Cache County’s plunge is into Hyrum’s dam waters. February 16, Deer Creek Reservoir, at the southern end of the Heber Valley will be the site of the plunge. Stay in Park City at the Woodside Inn, Old Town Guest House, or Silver Moose Ranch, in Midway at the Blue Boar Inn, or in Kamas at the Woodland Farmhouse Inn. For more information, check out the Utah Special Olympics website.